Achieving long term success without mastering weekly planning is like cooking without ever being able to taste the food. Shortly, it’s quite impossible. That’s the underlying reason why we’ve put together this guide. To help you ruthlessly prioritize your work. To help you actually find time for work that matters. To help you make small changes to your weekly schedule. Are you ready to finally get the maximum out of your time? Which task should be done first? How much time should be allocated to one task? How does my activity help us one step further to the goal? People across the globe are struggling with "getting the week done" on Fridays. Huge workloads and tremendous pressure make us lose focus. But there’s one efficient process that helps answer all of the questions above. It’s called the Eisenhower Matrix, originating from Dwight D. Eisenhower. The Matrix is a simple 4-square grid dividing your tasks to 4 quadrants. It’s a great method for long-term and also short-term planning. At Weekdone, we use this method with our weekly reporting software. Before setting up next week plans and goals in the Weekdone tool, we make sure these tasks fall into the upper quadrants. The only way to manage work in a hectic start-up is by focusing plans on what’s most important. This quadrant is for items that you could not foresee and those you have left to the last minute. While planning your week, make sure these tasks get done during the first half of the week. When you are using Weekdone for your weekly planning and reporting, enter the Urgent/Important plans first and focus on those. Plan to handle the unexpected or reschedule some other item. Items listed here stop you from getting your work done. If these tasks can’t be eliminated, at least delegate them. These tasks are probably the ones that needed an upfront “NO!” in the first place. In order to achieve long-term success, these items should get most of your attention. With proper weekly planning, these tasks should take up majority of your time. If you fail to deal with these tasks now, they will move to the first quadrant and become urgent. These items are the biggest distractions. Not everything that can be done must be done – or even planned. Simplify and declutter your to-do list by throwing these straight into the dustbin. 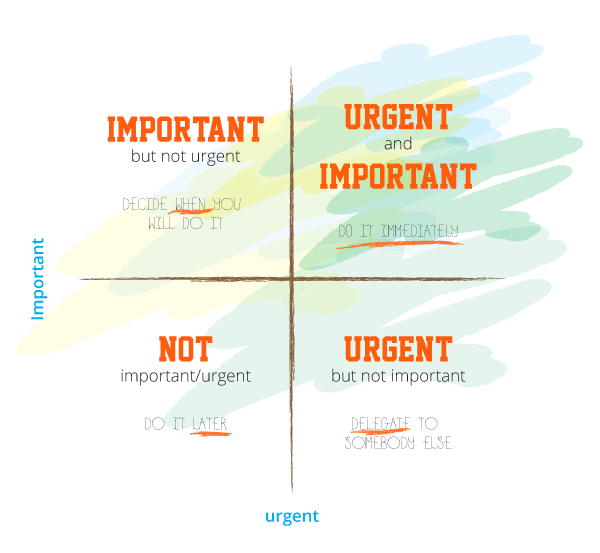 The Eisenhower matrix expedites time management when used regularly. As you list them in the box, do so by priority. When finished, address the urgent/important tasks immediately and dismiss the not urgent/not important tasks. If possible, delegate the items in the Urgent/Not Important box or leave them for the future, when there are no more important tasks. The Non Urgent/Important tasks should be assigned a completion date, but they should never take priority over Urgent/Important tasks. The key benefit to the Matrix is its elegance. It lends itself so easily to accessibility and function. The template is easy enough to draw and photocopy and you are able to achieve the maximum benefit when you use it along with weekly planning tool. After figuring out what really matters and which issues need to be addressed, you need to find the time to deal with these tasks. According to the statistics 80% of people don’t want to go to work on Monday morning. The 2 most common things they say on Monday mornings are “I have too many things to do” and “There’s not enough time to do it all”. So we procrastinate, look at our task lists and have no idea where to start. Yet, there is no reason to get demotivated, because if you know your priorities and have created a weekly plan, then you are already half way there. 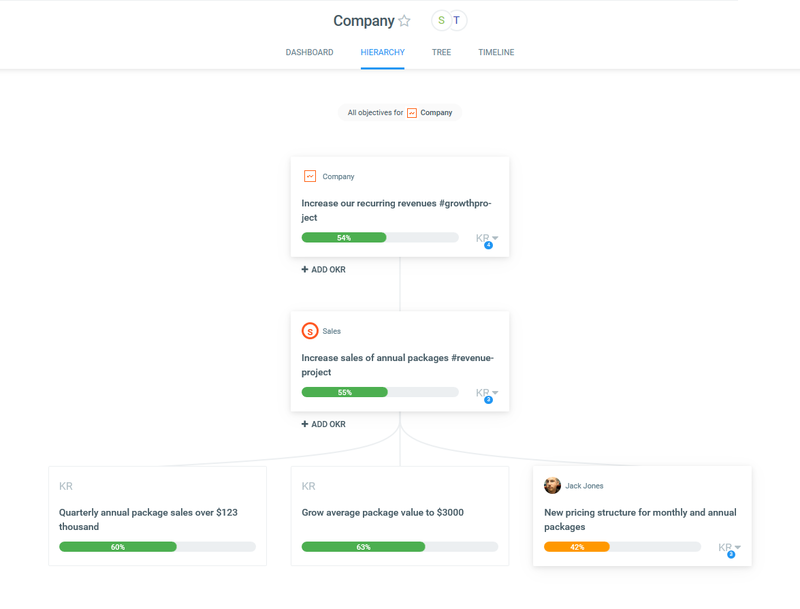 By having divided your week tasks into 4 quadrants you already know where to start from. Focus on what’s important and to do those selected things really well. Usually only a few of the dozens of items on our to-do lists are tied to big crucial goals and high-impact objectives. It’s ideal to limit the number of weekly plans you absolutely have to achieve to a maximum of 5 per week. That’s one big hairy goal that you have to achieve per day, whatever it takes. Too much choice is bad. It’s human to choose the small and easy-to-accomplish tasks, not important strategic ones. Achieving many small goals gives us an illusion of progress. At the same time multitasking lowers IQ by 10 points and kills productivity by 40%, according to Harvard Business Review. If you listed your 5 key goals for the week, choose the most important one of them and start working on it. Not two or three. Just one. By not having multiple options, you can’t choose the path of least resistance. Keep grinding until the plan is accomplished and you can report it as progress. Choosing a few key plans for the week is not easy at first. What helps is reflection at the end of each week. Was what you did important and worth one full week of work? During the week, whenever something gets done, don’t just delete it from your to-do list, write it down as progress. In Weekdone, we have made the move from planned category to the done list as easy as a click of a mouse. This also helps you reflect on your progress on Friday. Look at your progress list and analyse each item. Have you cheated a bit? Could you have done something else instead? Repeat the process weekly, learn and iterate. You’ll soon get pretty good at listing your key goals. Not everything you plan gets done. Quite often there are external reasons. Things get stuck or delayed. Don’t procrastinate on things you can’t solve yourself. Ask for help from your manager, your team mates, advisors or anyone else. Companies like Skype have used the 3-part PPP (progress, plans and problems) process for internal team communication and weekly reporting. Some companies call it ROC: results, objectives and challenges. There are other names, but the logic is the same. You set a goal and it either gets done in a week or there must be a serious reason why it did not move ahead. A weekly plan always becomes a progress or a problem. Because something can be done, does not mean it must be done. Be mindful of your goals. Take a minute or two to think whenever someone asks you to do something or you start writing something down as a to-do. Start saying no to many of the things and focus only on selected plans. Leave out unimportant things. Do only the big things. Planning your next week on Friday evening before leaving work is the best solution for Monday blues. You’ll keep your weekend worry-free and you can start right away on Monday morning. Furthermore, Friday evenings are a perfect time for weekly reflection. The progress you’ve made is still fresh in your memory and this helps you plan better. Looking at our to-do lists, we often write down actions or processes, not measurable results to be achieved. That’s why it is often hard to say if the task has been achieved or not. Therefore, if possible, focus on results instead. This way it will be much easier to declare a goal accomplished and move on to next big weekly objective. After all, you get what you measure. In a team environment, always explain to others, why you have chosen one goal over another and how your resources are divided. When your plans get accomplished, communicate the progress. Expect the others to do the same. Whenever a challenge comes up, share that as well. It helps both with getting feedback as well as keeping the team on the same page. A weekly paradigm is often ideal for these three – not too often, like daily e-mails and not too seldom, like monthly reports. Use either e-mail, Google Docs, intranet or a specialized tool like Weekdone, whatever works for you. People who have different responsibilities can divide their week into 5 days of different work areas. Then stick to them each week. 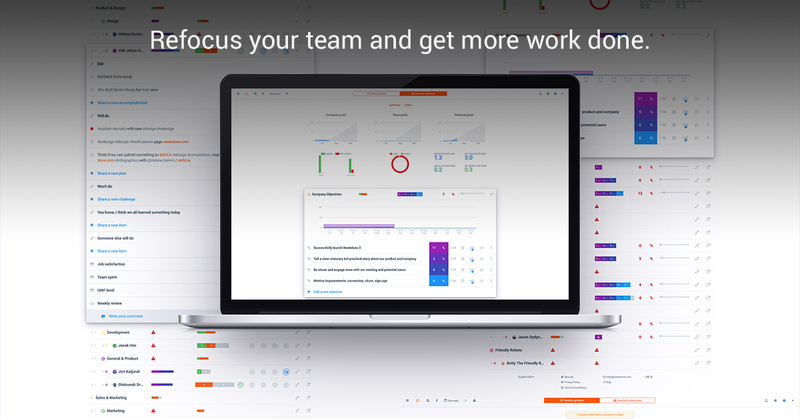 Communicate your days’ focus to your co-workers as well. You would not want others to disturb you and waste your time. Being interrupted, be it via e-mail or meetings, is an annoying waste of time in any team. Be nice to others and whenever possible, do not e-mail them, do not call for another meeting. You can enjoy your daily work much more by limiting yourself to a smaller number of important goals and executing those really well. Keep it simple. Declutter. You’ll do more by doing less. No matter what products your company sells or what kind of services you provide, in the end of the day, you need to get things done. The best chance this happening is to prioritize your tasks, find out which need your immediate attention and which ones need to be ditched from your list. Write down most crucial plans and work productively throughout the week. 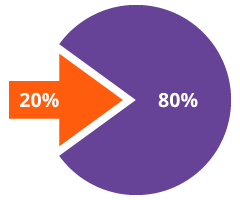 While you are doing the best you can, remember the Pareto principle: The Pareto analysis technique is all about doing 20% of the work with a direct impact on the 80% of the results. This is going to help you out, especially if you are able to complete the majority of the 20% early on. Although you are completing less work during the week and are less busy, you are actually finishing more and able to move ahead with your weekly work schedule. So, when you walk into work next time, sit down and look at everything you need to do throughout the week. Write all your plans down. Analyse what kind of impact each task has and move the most important ones to the top of your priority list. 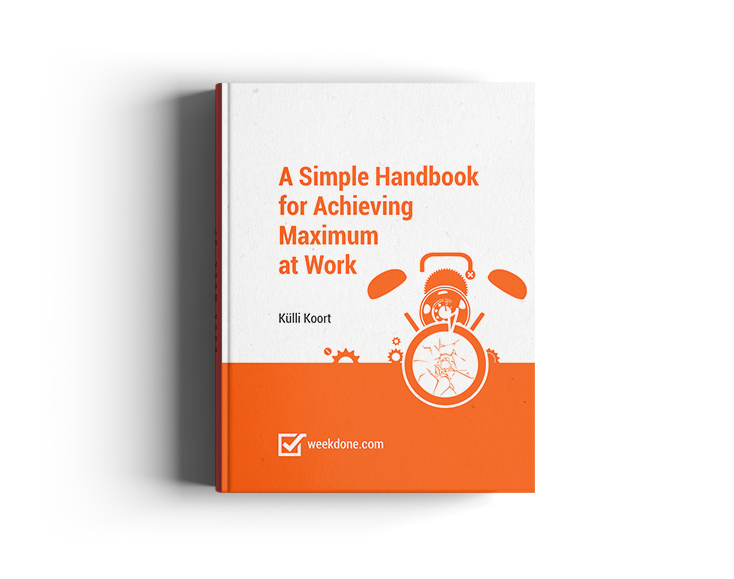 You are going to see some of the smaller tasks you need to complete are actually going to have a substantial impact on some of the longer tasks.